Loughrea-based Neylons Facility Management was named one of 11 National Winners from 77 businesses representing the Ones to Watch in Ireland at an exclusive event held at the British Ambassador’s residence in Dublin for The European Business Awards, Europe’s largest business competition, sponsored by RSM. Neylons Facility Management was chosen by a panel of independent judges including senior business leaders, politicians and academics as the best in their country in the Awards’ category of the Best Workplace & People Development Award, and they will now go on to represent their country in this category in the final stage of the competition. 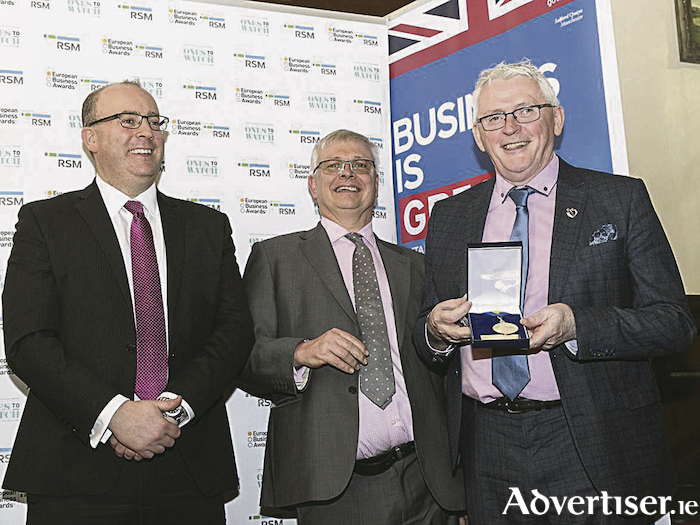 Previous winners include Galway based company Aerogen. Neylons Facility Management was founded in 2004 by Sylvester Neylon in Loughrea. Sylvie has gone on to build strong and lasting relationships with all his clients and now Neylons have a team of 500+ nationally providing a one stop shop in facility management. Together they have grown Neylons into an innovative leader in Facility Management for Healthcare Sector, nursing homes assisted living and office and retail. Over the last five years they have grown their market share in Pharmaceutical and Construction Sectors including Data centres. Services include Caring, Catering, Cleaning, Security and Electrical and Mechanical Facility Management Services. All will agree Sylvie’s success has come from his enthusiasm and passion and his interest in innovation and developing those around him to be leaders also. Hence why he is so proud of Best Workplace and People Development Award. This year 20 graduates will receive their certificates from Adi Roche and 20 more will begin the yearlong program. The National Winners from each country will face further judging in their chosen category, and the final Category Winners will be announced at the European Business Awards Gala Final in Warsaw, Poland in May 2018. Separately Neylons facility Management is also competing in a public vote to be named ‘European Public Champion’ at the Gala Final. The ‘vote for us’ video will go live end of February and engages with people from across the globe. Last year the public vote generated almost 250,000 votes. To view Neylons facility Management video and vote please go to: www.businessawardseurope.com The European Business Awards is now in its 11th year and its primary purpose is to support the development of a stronger and more successful business community throughout Europe. Last year it engaged with over 33,000 businesses from 34 countries. Sponsors and partners include RSM, ELITE, Germany Trade & Invest, PR Newswire, Bureau Van Dijk and SDL Managed Translation. Investec is the sponsor of the UK event at the London Stock Exchange.